Hello lovelies! 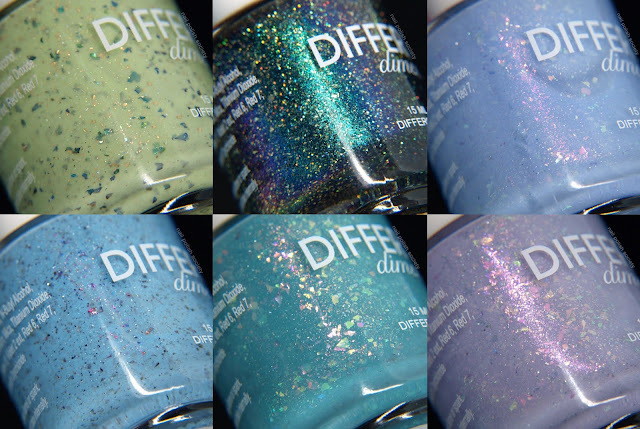 I have six new shades from Different Dimension to share! The formulas were all very nice and I didn't have any issues with application. I am especially loving the soft pastel shades at the end of the post. Oh and if you like multichromes, there is a really special magnetic you will love. Let's get to the swatches..
March 2019 "There Is No One Alive Who Is You-Er Than You" is a light green crelly with added UCC flakies, gold microflakies, and holographic microflakies. Shown is two coats plus top coat. April 2019 "If You Don't Like Something, Change It" is a sky blue crelly with added UCC flakies, and holographic microflakies. Shown is two coats plus top coat. "B(EARTH)day 2019" is a navy blue to green to purple magnetic multichrome polish with gold flakies and gold holographic microglitters. The magnetic effect isn't very strong but it is so pretty and unique! Shown is two coats plus top coat. All Of The Stars is a turquoise crelly with added aurora shimmers, iridescent color shifting flakies, and holographic microflakies. Shown is two coats plus top coat. Sky Full Of Stars is a lavender crelly with added aurora shimmers, iridescent color shifting flakies, and holographic microflakies. Shown is two coats plus top coat. Rocket Man is a cornflower blue crelly with added aurora shimmers, iridescent color shifting flakies, and holographic microflakies. Shown is three coats plus top coat. These polishes will all be available Sunday, April 14 at 9am edt at www.differentdimension.us. The POTM's and B(EARTH)day shades are limited edition, only available until April 30th.